This savory stew is made of beef tripe and chorizo de bilbao, flavored with Mama Sita’s Caldereta Mix, and traditionally served with olives. Boil tripe in water. Discard stock. Combine the tripe and ox feet in a casserole. Add water and bring to a boil. Lower the heat and simmer until very tender. Remove the gelatinous part of the ox feet from the bone and slice into 1 inch by ½ inch pieces. Cut the ox tripe the same ways. Set aside the bones for a future use. Heat oil in a sauce pan and sauté the garlic, onion, beef, potatoes, carrots and chorizo. Pour in 3 cups broth and bring to a boil. 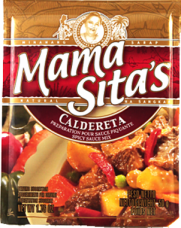 Add the Mama Sita’s Caldereta Mix and continue cooking until the potatoes and carrots are tender. Add the tomato paste, bell peppers, chickpeas and Vienna sausage and Mama Sita’s Achuete Powder, mix well and bring to a boil. Lower the heat and continue cooking until sauce thickens. Serve immediately.